The return of the Cold War in Europe! During the past few days, Europe is in shock and disbelief. The developments in Ukraine and its region of Crimea, would well suit a Hollywood film scenario: but no, what is happening there is happening for real. The Russian leadership decided to "protect" the Russian speaking population of Crimea and Eastern Ukraine, by sending troops to annex the region. These excuses that Mr. Putin and his government are presenting us with, are no different than what the Turks were supporting about them invading Cyprus. "We are doing it to protect our nationals from violence, therefore we are entitled to invade another nation and compromise its sovereignty by force". Firstly we haven't seen any violence yet between the regions of Ukraine or among its ethnic groups. So where does this argument stand? Secondly, even if the crisis in the country escalated indeed, Russia should not have taken the situation in its own hands, without the agreement of any other UN member states. The outcome of such actions could be similar to those of the Turkish ones in Cyprus, where the situation still hasn't been resolved after so many decades. The only difference here is that in Ukraine's case, because the West has interests in the region, they will make a serious effort to find a solution and compromise. Even if the situation is as Mr. Putin describes it, that the crisis won't descent into a war between Ukraine and Russia, or that the troops in Crimea are not Russian soldiers but pro-Russian local self-defense forces, (The Guardian) his actions are still unacceptable. The interests of both the Ukrainian and Russian people, do not lie with the interests of a few Russian oligarchs, but with a closer cooperation and relationship with Europe. What would be best for our continent, is for Europe and Russia to become closer partners even allies, putting the decades of the Cold War well behind them. The citizens of these two nations would benefit more if they had similar benefits and rights to those of countries like Norway; free movement, better living standards, opportunities to study and and travel visa-free across Europe. What their leadership is doing, is creating a canyon between the EU and Russia with few chances for an ever improving relationship. The Russian government simply is showing their true colors and nature. They do not have the best interests of their people in mind, rather they are still living in the past, in an era that should be put well behind us. The Cold War mentality should be abandoned by either side. While Europe has a fair share of blame in the situation, by sticking way too close with the USA over the years and not seeking to solidify better relations with its neighbors and other global powers, Russia is totally wrong here. Just because its middle aged leadership hasn't abandoned its Cold War mentality that they grew up in, wishing for things to remain as they are,or even worse go back to what they were before, the whole continent of Europe faces the threat of instability and turmoil. Perhaps that is what the Russians are trying to achieve and Ukraine is just the chess mat. 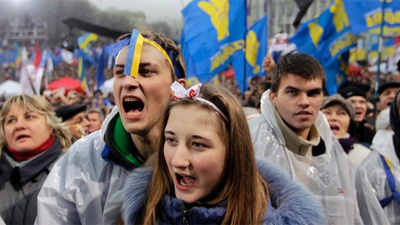 If Ukrainians want closer relations with the EU, they should be allowed to have them. Even if the day comes that the country is accepted in the EU, I do not see why this is such a bad thing for Russia. Millions of Russians will become EU citizens, as thousands are already, through the membership of the Baltic states. Russia might lose territories to have under their "influence", but they are going to have influence in the EU itself, since millions of EU citizens and thus voters, will be of Russian origin. And what is this issue of splitting Europe in parts and spheres of influence? We are one continent and it will be wise to bring all of Europe's nations together, from Iceland and Portugal to Ukraine and even Russia itself. I do not believe that a Russian EU membership would be good for either party, but a closer relation and cooperation between the two would certainly benefit both sides. The Western nations and Russia must abandon this mentality of carving Europe and the world in parts, according their interests. Last time we did that, the consequences were bad for all of us. Besides, we can not engage in war between us. Europe is still trying to recover from the economic crisis, a war right now would be disastrous. It took us decades to achieve what we have and a new war could spell the end of our efforts. Any sanctions we could impose to punish Russia for its actions, as proposed by many European governments, won't wear the Russians much. Sadly they are not Iran, they have vast resources and they can live with them. Besides, we are the ones who rely on their oil and gas. I am afraid the only solution left to end this tug-of-war between Europe and Russia, is for the Russian population to do what the Ukrainians did and change leadership. Only if their current administration with its outdated mentality and policies is ousted and when Europe forms an independent from the USA foreign policy, we can eventually see stability in out continent. From the West all the way to the East. If one had watched the Winter Olympics’ extravaganza attentively (for which Putin spent billions of rubles) the message was loud and clear and what happened subsequently in the Ukraine could have been better predicted. The message was that Western Civilization (which includes the US by the way…and it is proposterous to suggest that Russia and the Eastern part of Europe is really rising up against the US and not the EU) is a decadent corrupt civilization that has betrayed its spiritual roots and inheritance ( which are not necessarily religious roots either), while Russia is a pure civilization which has retained its cultural values, appreciative of cultural phenomena such as literature and ballet and art in general, knowing full well its cultural identity. Which is to say, now that We have made Europe we need to make the Europeans, which is equivalent to having put the cart before the horse. That critique implied in the show at the Olympics ought to have been paid attention to. Of course the whole premise of Putin and his anti-democratic oligarchs is misguided: one does not impose culture with brute force; but on the other hand before presenting ourselves to Eastern European people asking them to join our brave new world based on consumption, economics, political power, mega-nationalism, and soccer games, which somehow make us all “Newropeans” have we really thought long and hard on what it means to be a European and what have we rejected of our millenarian inheritance and of the spiritual roots of Europe? That is a crucial question while the ability to vote and democratic institutions as important as they are for any kind of polity do not by themselves constitute a cultural identity, especially if one insists that they are neutral and devoid of historical roots. A preview and an announcement to the readers: in the next issue of the Ovi symposium (due out soon on March 13) there will be a whole discussion of the spiritual roots of the EU and how they have been betrayed by a positivistic materialistic civilization pretending since the Enlightenment to be superior and worthy of imitation by the rest of the world, and why the Russians have refused to take the bait. So, stay tuned and let those who have ears, let them hear.